Listen Up! serves the church in spreading the gospel and building up the members in their faith. They do this by way of various projects. In the past this was only in the Netherlands and Belgium. In 2003 Listen Up! traveled to Austria, Croatia, the Czech Republic and Germany to proclaim the good news as part of evangelism activities in those countries. In recent years they have traveled to France and Germany as well as serving in the Netherlands and Belgium. These projects are only possible because people help financially. To promote song in the churches Listen Up! recorded a CD with the first 97 songs from the song book which the church of Christ in Haarlem (and in general also the church in Maastricht and in Antwerp, Belgium) uses. The melody of the first verse and the chorus of these songs have been recorded. The CD can be used by members who want to learn more songs, by song leaders who need support in learning new songs (or teaching them to the congregation) and by children's class teachers who want to learn and use more songs. In this way all of the songs from the song book are used and everyone can expand the "repertoire". In the summer of 2002 Listen Up! organized a "Song Seminar" as an international project. During an extra long weekend held in the church building of the church of Christ in The Hague there was plenty of singing and various lessons were presented. Among other things the lessons were focused on the use of the voice, reading music, writing songs, leading a song service and what it means to sing for God. The participants of the seminar formed a choir which offered a concert for the neighborhood at the end of the seminar, another opportunity to spread the gospel. Listen Up! hopes to plan another such seminar in the near future. Listen Up! dreams of the possibility of putting together a dvd with harmony recordings of a song book. In this way members could not only learn the melody of a song, they could also learn one or more of the harmony voices in order to be able to sing in harmony in the church. By listening to and learning from an example on the dvd, the listener could learn harmony songs without knowing any music theory. This is a short (30-45 minute) concert that functions as "party" for a "Let's Start Talking" (LST) or similar project. 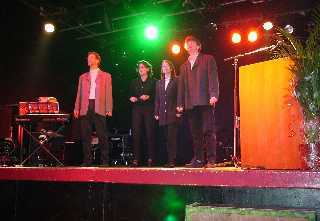 At this concert all songs and comments are in English, the projected texts are also in English and a vocabulary is emphasized using a handout which fits with the lessons and encourages conversations. Additionally, the members of Listen Up! make time to speak to the visitors, in English, of course. This concert is focused on publicizing the summer camp weeks of Ardennen Bijbelkamp. A congregation can plan a concert, invite young people and their parents and in this way introduce and emphasize the Bible camp among their youth and their friends. For several years now various congregations in the Netherlands and Belgium have used Listen Up! in organizing a Christmas concert. A Christmas concert is the ideal opportunity to focus on the gospel. Well-known Christmas carols are intermingled with songs with a "strong and clear" message which presents the complete story of Jesus' life. The congregations organize activities around the concert and are equipped to reach out to the (potential) visitors. Listen Up! is thinking along the same lines about possible Easter concerts (which wouldn't necessarily have to be at Easter), of concerts during certain seasons and of themes. Do you want to organize a concert or invite Listen Up! for an evangelistic activity in your congregation, then just contact us.